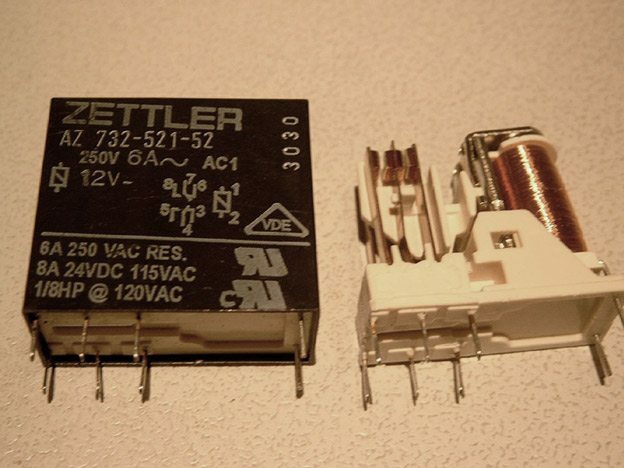 The magnetic, coil system or motor unit is also called the energizing or primary side of a relay. lt consists of all the parts used to transform the electrical energy in the primary side into mechanical force to actuate the contacts and switch the secondary circuit. The magnetic circuit consists of non moving metal parts such as the core, yoke and a movable armature. and an air gap between the armature and the pole area of the core. The armature closes and opens under the influence of a magnetic held, its movement directly or indirectly operating the relay contacts. The magnetic field is generated by a coil consisting of copper wire wound in layers around the bobbin in which there is an iron core. If voltage is applied to the coil terminals a current (Ohms law l=U/R) flowing through the coil generates a magnetic field and hence magnetic flux. This induced magnetic held/flux is directly proportional to the coil current and the number of tums of the coil (H ≈ n*I, H=magnetic field, n=number of turns. I=coil current). Due to the high permeability of the soft magnetic iron core in comparison with air. the magnetic field concentrates within the magnetic circuit (except the stray field).